<!-Stanley Ray Badmin. 1906-1989--> Stanley Ray Badmin. Richmond Bridge. Richmond Bridge. 1931. Etching. Beetles 24. 4 3/8 x 6 3/8 (sheet 9 1/2 x 12). Edition 50, #3. Published by the Twenty-One Gallery. 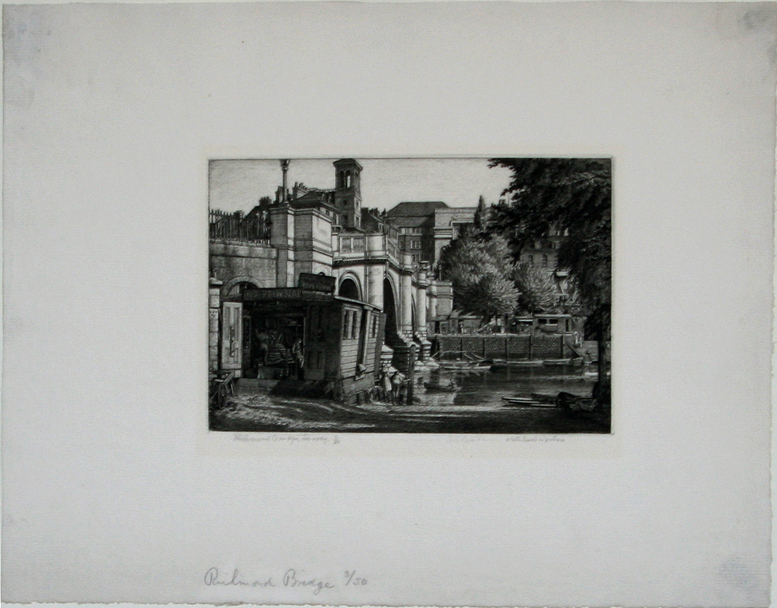 Exhibited:Royal Academy ofArts, 1931. Royal Society of Painter-Etchers and Engravers, 1932. Art Institute of Chicago, March - May, 1932. Illustrated: The Studio Nov. 1931, p. 348. A rich, tonal impression printed on cream laid paper with full margins and deckle edges on two sides. Signed, titled and numbered in pencil. $1,750. Richmond Bridge is an 18th-century stone arch bridge that crosses the River Thames at Richmond, connecting the two halves of the present-day London Borough of Richmond upon Thames. 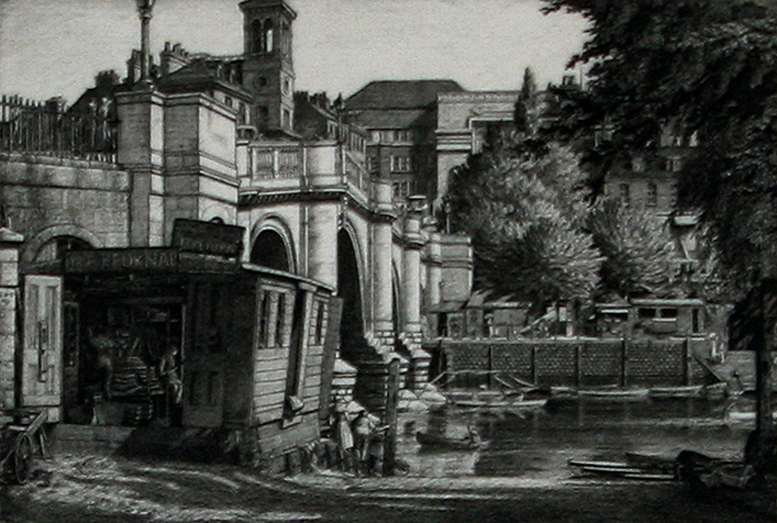 Because the river meanders from its general west to east direction, flowing from southeast to northwest in this part of London, what would otherwise be known as the north and south banks are often referred to as the "Middlesex" (Twickenham) and "Surrey" (Richmond) banks respectively, named after the historic counties to which each side once belonged. The bridge was widened and slightly flattened in 1937–40, but otherwise still conforms to its original design.